Hi, guys! I used to formerly be known as MultiTalent on YouTube, but due to some personal obstacles and such, I have rebranded myself as Imar Morales-Rivera and would like to revamp The Chosen Ones with a better vision and higher quality in mind. Thankfully, the project hadn't started yet, but on the opposite side of things, I seem to have lost all my VAs, singers, artists, and music directors. That's where you come in! Synopsis: A few years after the events of Season 4-5, most of the Mane 6's siblings have grown up... And had kids! After they visit, strange things start to happen, and it becomes the time to train these fillies to be like their aunts. Could they be the new Elements of Harmony? Warning: This project will hardly be close to the canon, as the story was written back in 2015 with no intention of changing any plot or character basis later on. Please keep this in mind and be courteous when possibly criticizing the project. If there are any questions, email me at my Gmail (staymultitalented) or directly message me on this site. Please, please, please feel free to share this project with anyone you know. Auditions are definitely appreciated, whether or not you believe you have talent (it could very well be different in my eyes). Firehot is the daughter of Scootaloo and Orion Solstice. 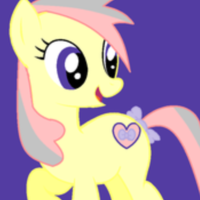 She is also the niece of Rainbow Dash, considering Scootaloo has a sister-like relationship with her. 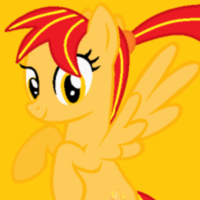 This fiery pony is extremely hotheaded, much like her rainbow-haired relative, and takes pride in everything she does. She enjoys racing and flying at high speeds. Please keep in mind that she has similar behavior to Scootaloo and Rainbow Dash. Also, her voice is a balanced mixture of the two, with just a little bit more deepness. The name's Firehot. I heard you finally became a Wonderbolt. Big fan. Just look at us. 'Rock Girl' here doesn't seem like the laughing type. 'Playstation' barely seems generous when she hoards her games like they're her whole life. 'Sword Lord' is avoiding all magic so she can play with her toys. The sewing one might be honest... When it comes to making clothes... And 'Green Thumb' has a mean side, let me tell ya that! 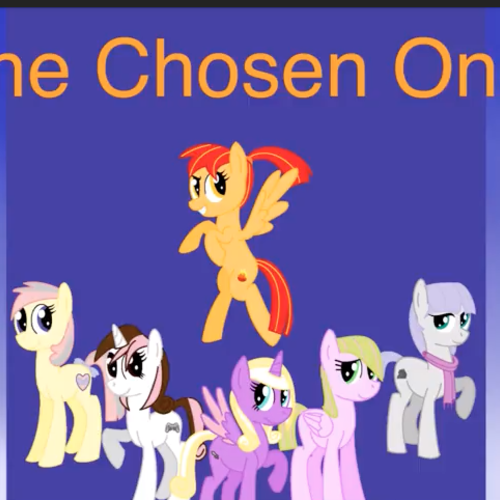 I can't see this group of mares saving a whole kingdom. Firehot sings without fear of being heard or being loud. Situation: Firehot is explaining that her pride is something worth showing off. Granite is the daughter of Maud Pie and Double Diamond. 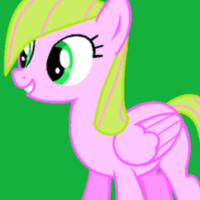 She is also the niece of Pinkie Pie. Granite is very much like her mother, both in appearance and in sense of humor, but is very strong-willed and fearless. Although she enjoys rocks, rocks, and more rocks, Granite is able to crack a joke now and then, usually to cheer up somepony. Granite's tone of voice is pretty much like Maud Pie's, except since she is a teenager, it is a teeny bit higher. Even when she's saying a joke, she sounds monotone. They're not things, they're rocks... Minerals that shape our world. Maybe you should watch before you step on my rock collection! I'm sorry... Hey, what musical instrument is found in the bathroom? A tuba toothpaste. When she sings, her voice is no longer monotone, but instead extremely gorgeous. Situation: Granite is cheering up Pinkie Pie and finally realizes what Laughter is. Pixelz is the daughter of Sweetie Belle and Button Mash. 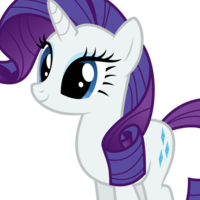 She is also the niece of Rarity. Her personality is completely different from her aunt's, since she is a definite tomcolt. She is not afraid to speak her mind, even if she hurts feelings of others. Her love of video games has inspired her to take technology classes, in which she excels. Pixelz enjoys video games, computer games, and hacking into databases. 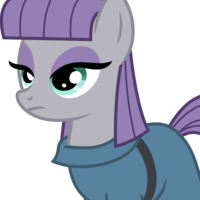 Because of the fact that Pixelz is a tomcolt, it is extremely important that she does not sound at all like Rarity whatsoever. She needs to have a voice similar to Button Mash's, but with a feminine tone like Sweetie Belle's, of course. I highly suggest following the link to the original cast because my old Pixelz is pretty much how I want her to sound. I've been playing for most of my life. Do you see me with glasses or anything? Dude, I just get stuff. My parents own one of the richest franchises in Equestria, and I don't plan on giving away anything I have anytime soon. Now can I have my game back? I know, right? Ya know, I'll let you play with them anytime you want, just as long as you stop calling me dear or darling. Her voice has no specific guidelines, but the lyrics will be changed a little to be more appropriate. Situation: Pixelz is daydreaming about her video game crush. Appliqué (App-lee-kay) is the daughter of Apple Bloom and Rumble. She is also the niece of Applejack. Appliqué is the opposite of Applejack, just like Pixelz and Rarity, what with her graceful ways and love of sewing. 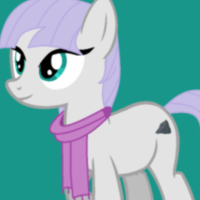 She is very much of a well-mannered young mare, and she enjoys making things, dancing, and reading. Unlike the majority of the Apple Family, Appliqué does not have a country accent. There is no other accent either. She speaks proper and makes sure to speak without rushing. 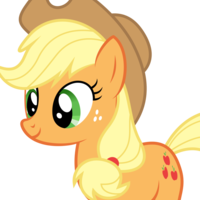 Aunt Applejack. I understand what your Element means. It means saying what's on your mind, even if it hurts other ponies' feelings. Our encounter earlier helped me learn about my weaknesses and lack of contribution to the Apple Family, and I feel horrible for that. Like my mom, I wanted to be the best I could be, but the direction I went in was wrong, and hopefully, I can be forgiven. I'm Appliqué. Nice to meet you. She sings with grace, making sure to be articulate. Situation: Appliqué is looking in a mirror, seeing her pretty face, but wonders if she is good enough for her aunt. Flora is the daughter of Aurora Shy and Comet Tail. She is also the niece of Fluttershy. Her personality is almost exactly like Fluttershy's, but when she gets angry, Flora is very blunt and does not show much kindness. Instead of an interest in animals, she enjoys gardening and has an appreciation of plants. Flora has a shy voice, like Fluttershy's (not too similar though), but when she's angry, she's loud. Remember to shout a bit when saying her angry lines, but not to the point that it affects the quality of your audition. Next time, pay attention. You have eyes for a reason. You prefer animals over plants? How could you not love plants more than animals? They are delicate organisms that cannot be second place to... Those things! Flora's voice is soft like Fluttershy's, but when she's getting deep into the song, she gets louder. The lyrics will be changed to fit the situation. Situation: Flora and Fluttershy are arguing about whether plants or animals are better. 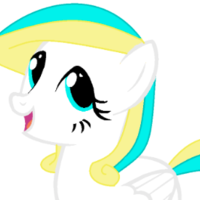 Cristal is the daughter of Princess Cadence and Shining Armor. She is also the niece of Twilight Sparkle. Cristal's personality is not specific to any of the members in her family, but she is very nervous under pressure, just like her aunt. She enjoys swordfighting and reading, but avoids magic whenever she can. Her tone is much like Twilight's, so she needs to sound a bit like her, but she has a teenager voice as well. I highly suggest following the link to the original cast because my old Cristal is pretty much how I want her to sound. Sorry, I just want to be like my dad, your brother, the Captain of the Royal Guard! YES YES YES YES YES YES YES YES YES YEEEEEESSSSSSSS! Cristal's voice sounds very similar to Twilight's except it's softer. Situation: Cristal and Twilight Sparkle are freaking out about everything that's going on, and they're having trouble being optimistic about finding a solution. The Princess of Friendship and Cristal Armor's aunt. She is also her mentor, and is still very nervous with everything she does. 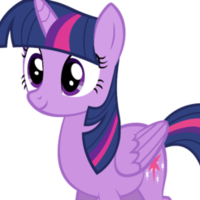 Twilight Sparkle sounds exactly like she does in the show. Since she is an Alicorn, her voice has not aged at all. What if it's not perfect?! Something could go wrong... It always does! Oh, you're exactly like me, what with your frantic antics and awkwardness! Believe me, when I was a filly, I messed up so often, but I kept trying. We'll still be friends, right? Her singing is exactly like how it sounds in the show. The honest country pony and Appliqué's aunt. She is also her mentor, even if she's embarrassed of what her talents may be. Applejack still sounds the same, even though she's a bit older. Look, 'ahm mighty sorry for yellin' at y'all... It was just me bein' angry. The true definition of Honesty is telling the truth about somethin' without hurtin' feelings as much as possible. 'Ah just wanted the Apple Family to last a bit longer, but 'ah guess everythin' has to end. Can y'all forgive me? No, Appliqué, 'ah still don't think ya get it. Y'all don't need any accents or apple buckin' skills. 'Mah honesty was not the right kind. Stay who ya are, even if it's not somethin' not everypony is okay with. 'Ahm okay with it now, and that's the truth. What's the big deal with this here cutie mark?! Situation: Applejack is singing to Appliqué about how her cutie mark is perfect, no matter what anypony says. The loyal pony of the Mane 6 and Firehot Solstice's aunt. She is also her mentor, and is very stoked to show off what she can. 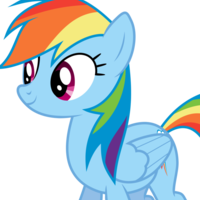 Rainbow Dash still sounds the same, even though she's a bit older. Listen, the point of this training is to bring out the Element inside of you, and since you're my niece, you're gonna have my Element, which is Loyalty. Do you even know what Loyalty is?! It's okay, kid. I was full of myself once too. You can still be prideful and show off your talents, just as long as you don't get carried away. Let's kick some Changeling flank! Her singing is exactly like how it sounds in the show. The lyrics will be changed to fit the situation. Situation: Rainbow Dash teaches Firehot the definition of Loyalty by remembering when she had to face Nightmare Moon's Shadowbolts. The generous pony of the Mane 6 and Pixelz Mash-Belle's aunt. She is also her mentor, and would like to should her how wonderful it is without video games. Rarity still sounds the same, even though she's a bit older. Where's your sister, Fluttershy? You said she was coming to meet us. My goodness! Do you know how much work it took to restore it's natural beauty?! I'm very much glad that we are banishing you, because you are an EVIL ROYAL PAIN! Well, my sweet Pixelz, generosity is part of who you are as a pony. You must give in order to receive, as many say. That is very clear, correct? Situation: Rarity is forced to snap Pixelz out of her gamer daze. The lovely Princess of the Sun. Something has happened in Equestria, and she has plans to stop it by making a few changes to Equestrian history. Princess Celestia's voice is the way it's always been, but she needs to sound sad sometimes. Add some crying in there for extra emotion. Dear Princess Twilight Sparkle, I apologize for interrupting the reunion you informed me about days ago, but there is something going on. 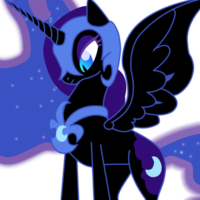 Last night, I heard a scream coming from Princess Luna's room. When I came in to check on her, she was gone. The only thing left of her that remained was her crown. 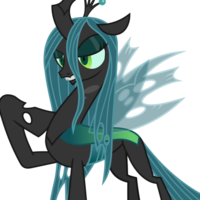 Queen Chrysalis has also been sighted in the Everfree Forest, even though it was thought that Princess Cadence and Shining Armor banished her. I have a feeling that the enemies you've defeated are slowly returning to take revenge, and their targets are you and your friends. Please see to this and find a solution, most likely with your Elements. Thank you for your patience and I hope that you find a change in our future for Equestria. I hope she returns soon. Please bring her back, my Chosen Ones. Situation: Princess Celestia is retelling the story of Nightmare Moon to herself, hoping she will fall asleep to her own lullaby. My minions, it's time that we take control of what was once ours. Before the rule of the Two Sisters, I was a beautiful queen, but of course, those... Alicorns... Had to take everything away. I was exiled, as were you, my Changelings. For more than a thousand years, we have been living in this forest, until I concocted a plan that would send Celestia and the others into misery! It's been in progress for a very long time now, and we have met today to take action. Oh, look what we have here. A spy, just waiting to destroy all the hard work I have been doing. Minions, trap her! She must sound evil and have the effect of a Changeling. There is a tutorial on how to do this in the voice actors section. The lyrics will be slightly changed to fit the situation. Situation: Queen Chrysalis and Nightmare Moon are discussing their plans for when they rule Equestria. After Luna's sudden disappearance, Nightmare Moon returns to make the night finally last forever. Nightmare Moon's voice is distorted when she laughs. If there is a way that you can add effects to your recordings, then feel free to do so. Unfortunately, sister, I am not here to come back. The night will last forever, no matter who holds the Elements. She must sound evil like the other villains. The lyrics will be slightly changed to fit the situation. Sweetie Belle is now married to Button Mash. 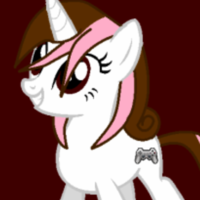 She has gotten her cutie mark and is the mother of Pixelz. Sweetie Belle and her husband work together to create and program video games, and their gaming franchise has become very well-known. She is very mature and still has a passion for singing, but now knows that she can have two talents. 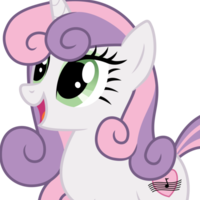 Sweetie Belle's voice is no longer high pitched, but she still maintains her tone and loving sound. Basically, make her voice mature. I'd love to. Hopefully you're not a stalker. You're really tall... Haven't I seen you around before, Button Mash? Of course, thank you for the offer. I think we might just get along. Sweetie Belle's husband and Pixelz's father. He and Sweetie Belle own a video game franchise, which they have made a lot of money in. He does not serve a significant purpose to the story, but will comment every so often. 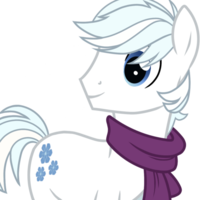 Button Mash's tone is no longer cutesy and he has gone through puberty. His voice is very strong and protective. Beat that, creeper! Good game, Sweetie Belle. Wanna meet at the arcade downtown? I kinda want to make my own gaming company. Would you do it with me? Apple Bloom is married to Rumble. 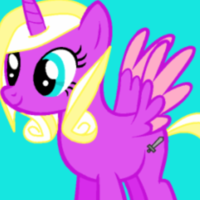 She has her cutie mark and is the mother of Appliqué. She does not have a particular job yet, but plans on becoming a dancer or actress. 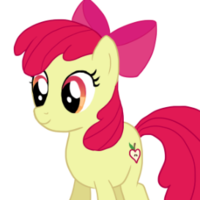 Apple Bloom has the same voice, except matured. She still has the country accent as well. Sis, she likes to sew. 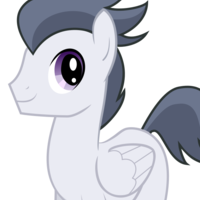 'Ah thought it didn't matter what cutie mark anypony got. Dear Rumble, 'ah wish ya a happy Hearts and Hooves Day. 'Ah love ya from afar, even if ya don't notice me that much. Sincerely, a hopeful somepony. Yes, 'ahm that special somepony. Apple Bloom''s husband and Appliqué's father. Rumble is not exactly sure what he plans to do, but is constantly looking for jobs that he might take interest in. He does not serve a significant purpose to the story, but will comment every so often. Now that he's been voiced in the show, there's finally a reference to follow, but make sure it sounds a bit more mature. Well, that's good, 'cause I was kinda hoping it was you. 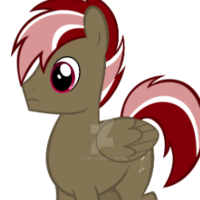 A survivor of the Rainbow Factory, Scootaloo's husband, and Firehot's father. He does not serve a significant purpose to the story, but will comment every so often. 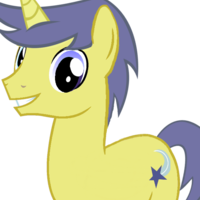 Orion's voice doesn't have a tone at all, since he's not from the show or my OC. If you have read the official Rainbow Factory fanfiction, then you would be able to create a voice that fits him. I'm so glad we got out of there... Hey, Scootaloo? Can we be together for the rest of our lives? This is a sedimentary rock. You are good enough. I will accept your proposal. Rocks and minerals are important artifacts of life. Maud Pie's husband and Granite's father. He has left the old Village of Equality to find something more suitable for him. He and Maud both work as geologists, discovering new minerals every day. There are a few... Additions to the families. You really know your stuff, don't ya? I'm Double Diamond. Right?! My dream has always been to go off and find anything and everything Earth-related. 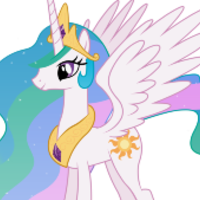 The Princess of Love and Shining Armor's wife. She also is the mother of Cristal Armor. She does not serve a significant to the story, but will comment every so often. 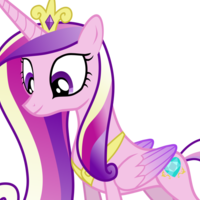 Princess Cadence's voice is the same as always. Look at how our little filly grew into a beautiful young mare. Cristal, don't you want to do something other than swordfighting? Princess Cadence's husband, Twilight Sparkle's older brother, and the father of Cristal Armor. 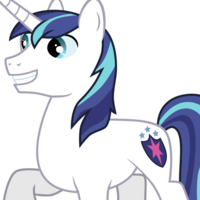 Shining Armor's voice is the same as always. Give her a second, Cadence... I think she actually enjoys this. Comet Tail’s wife, Fluttershy’s sister, and the mother of Flora Tail-Shy. Aurora is very kind and quiet, like her relatives, but also extremely clumsy. Her voice is similar to Fluttershy’s, except it’s not as whispery. Agreed. Sometimes, I just want a break from all of Flora’s rudeness. I know I don’t say much, but now, I’m saying something. We need to stop being pushovers, like my sister says, and keep track of our young mares. Exactly. What’s the matter with kids today? Aurora’s husband and the father of Flora Tail-Shy. He’s never really noticed by anyone but his family. Comet Tail doesn't have a specific voice, so you can create your own for him. Please excuse my wife, she's a bit clumsy. Yeah, we need to stand up for ourselves! Let's give 'em a piece of our minds! They must be firm and upset. Channel each's individual personality. Separate characters into different audition files on the same section. If you are looking to go for one or more parents in particular, clarify that before singing. Situation: Sweetie Mash-Belle and the rest of the parents talk about how rude and unfriendly their kids are. The jokingly great Draconequus who only wants a day to himself. 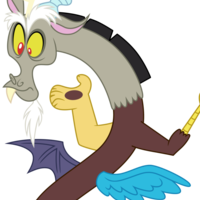 Discord sounds like he does in the show. Oh, you are such a funny pony, they need more creatures like you around. You see, today's my day. The potion-making zebra, who may or may not be okay when she gets too close to evil voices near her home. 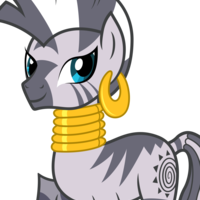 Zecora's voice is what it sounds like in the show. The Queen and her minions, I saw them, no lie, they put me in a shell, hoping I would die. I appreciate your help, but you must defeat the queen. Something tells me that we will not get out clean. The final war is what she will seek, remember to be strong or the future will be bleak. I need some of these cool guys! Email me at my Gmail (staymultitalented) some of your best animations to apply. I need some of these cool guys! Email me at my Gmail (staymultitalented) some art of my precious OC children to apply. I need some of these cool guys! Email me at my Gmail (staymultitalented) some of your best musical works, songs, lyrics, or instrumentals to apply.